Dodecahedral quartz after pyrite pseudomorphs to 3/8" on a side way upgrade this clear Arkansas golden healer cluster. Large miniature sized at a triangular 2x 3-1/2x 2-3/4" high with a partially quartz overgrown sandstone base, there are clear upright points to 1-1/2", dendritic iron overlays with drusy quartz over that, interesting natural etching, and some natural iridesence. 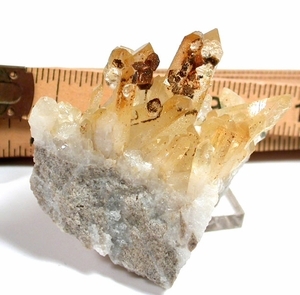 Two smaller crystals are baseless and one chipped at its' growth crater which does not detract from the rare occurrences listed above. Pride of place in your cabinet for type localities, pseudomorphs, dendrites! If you'd like Attard's Minerals test results, please ask us.